A few weeks ago, we discovered Carnivore Club, and for those of you that follow us on Twitter and Facebook, you have probably already seen our adoration. 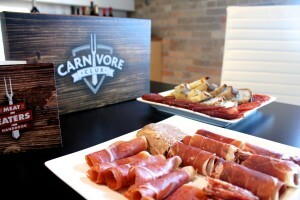 Like WineCollective, Carnivore Club curates and delivers premium product on a monthly basis. We recently received our first package and we decided to share it with you! What do you pair with charcuterie? Quite simply, one might think that meat = red wine, but that is not taking into account all of the variables in seasoning, body and textures, from salami to pâté. We decided to select some of our favourite Canadian wines and match them up with the November Carnivore Club shipment. Each package comes with your own “Meat-Eaters” handbook, explaining the flavours and uniqueness of each selection. This guide is very helpful when looking for your charcuterie wine pairing. Iberico Chorizo – Produceed from the black Iberian pig. Seasoned with paprika, peppers, garlic, and wine. Culatello – Produced from the rear leg muscle of the pig. Aged for 12 months in 500 year old caves in Parma, Italy. Bresaola – Salt cured, air dried beef. Seasoned with cinnamon, nutmeg, juniper, pepper, bay leaf, cloves, thyme oregano, rosemary. Pâté de Champage – A traditional Quebecois pâté from pork. Seasoned with pepper, wild mushrooms, white wine. Pata Negra – Cured ham from Iberico, Spain. Free range Iberico pigs feast on grass, herbs, nuts and truffles in an ecological reserve of oaks, conifers and cork. Toscana Salami a Finocchio – Traditional sausage made with pork. Seasoned with fennel seeds. The Gewürztraminer paired well with some of the lighter cuts and the pâté, but was too delicate for the chorizo and salami. The florals and honey notes were great with the pâté. An alternate white that could stand up to these meats would be a new-world Riesling with crisp acidity and light residual sweetness. You can order this wine directly from Sperling Vineyards and see what you think! This is a unique varietal from Austria, where a lot of the diet contains cured meats. Although we loved this wine, and it also paired well with the Bresaola and pâté, a spicier red like a Washington Syrah or Cab Franc would not be overshadowed by the seasoning of the Chorizo and Salami. You can find out more about Kalala and even order this wine directly from their wine club! A fortified wine can be hit or miss depending on who you are serving. This is a great alternative to a common pairing with a still wine. The Anniversary offers great spice, texture and fruit, plus a slight sweetness that lightly coats the palate. You can also buy this online from Southbrook’s wine club. When in doubt, choose sparkling! 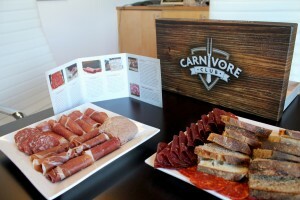 We think that you should check out Carnivore Club, it is the perfect gift to compliment your Holiday Package or subscription. WineCollective members can use the promo code “WC10” to receive $10 off the first delivery. 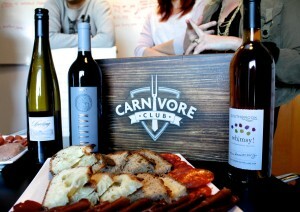 We are giving away one of the Carnivore Club packages to a WineCollective member. Tell us your favourite charcuterie pairing by commenting on this blog, writing to us on Twitter or Facebook by December 1. We will randomly draw from everyone who submitted a pairing suggestion!